As the culinary manager at Adolescent Growth Corina provides well balanced meals that are healthy, yet don’t “taste” healthy or bland. Chef Corina leads the delivery of nutritional meals aimed at helping our clients, particularly ones that struggle with some eating impairments, get on an individualized meal plans tailored for their needs. Born and raised in Romania, Chef Corina grew up spending a great deal of her time in the kitchen. Her friends frequently told her how good her food tastes and she loved putting a smile on their faces each time they tried something new she had cooked. “That’s when I decided to do something that I love, for a living” as reported directly from Chef Corina. Chef Corina traveled to the United States nearly 20 years ago to study. And even though she possesses the natural ability to cook well, she aimed to refine her skill by obtaining professional mastery. Chef Corina received her Culinary Arts /Chef Training and learned to cook and create a “meal experience” through sight, smell and taste. Following that, she wanted to continue to expand her knowledge and skills and decided to further her culinary education. She obtained the Serv Safe Sanitation Certification that further solidified her abilities. 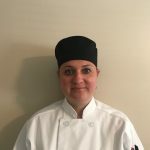 Occupationally Chef Corina gained extensive experience working as a Production Chef/Commissary manager for over 7 years at a local restaurant in the Lombard area. She was responsible for specific food preparation, product ordering, managing inventory while consistently practicing established safety and sanitation procedures for food handling and preparation of food. Chef Corina has gained wide-ranging knowledge for cooking in a professional kitchen for both small and large groups and for individualized dietary needs. Adolescent Growth Inc. could not have been a better match for Chef Corina. She receives “raved reviews” from our clients and from our parents as she delights with her dynamic meals at the Family Weekend Restoration Groups every Saturday. In her spare time Chef Corina enjoys spending time with relatives and friends, traveling to new places, taking dancing classes and baking for her large family.